Killer Characters: Do You Color? I'm new to Killer Characters, so I'm a little nervous. You see, I'm actually a private and quiet kind of person. My own mother has called me retiring! Unlike my younger sister, I'm not into sports, nightclubs, or hot trends. Frankly, I'd rather curl up at home with my cat, Peaches, and draw or read a mystery. By day, I manage the Color Me Read bookstore in Washington, DC. By night, I draw adult coloring books! I'm always doodling new ideas. The bookstore is in the Georgetown section of Washington, which is very cool. It dates way back, so the buildings are gorgeous. Unfortunately, it's a very popular place to live, so I'm constantly on the hunt for an apartment. I'd love to be able to walk to work instead of driving an hour on the Interstate in bumper to bumper traffic. So far, though, everything in my price range has been dark, gloomy, and too depressing. You might have heard of my boss, Professor John Maxwell. He's quite an adventurer and well known for his exotic travels. His family has been a fixture in Georgetown for generations. He's the most fascinating person I know. He's always pursuing some theory or mystery. He has an office on the third floor of the bookstore where he and his friends can often be found among amazing artifacts that he collected around the world. They peruse maps and have the most interesting discussions. The cover of the book about me can be colored! And the items around the center oval are the clues that I doodled. More about that next time. Do you like to color adult coloring books? The covers of COLOR ME MURDER can be colored! It's now available for pre-order. Be on the lookout for upcoming giveaways. I have only done a little "adult coloring" but for Christmas, my daughter gave me colored pencils and a coloring book. I love to color and can’t wait for this book! This is a really fun idea for a series. I do enjoy adult coloring books. Very relaxing activity. Goody, goody, goody--a new series from a favorite author! Welcome, Florrie. I love to color. I can’t wait to read this new book. I'm SO excited to get into this series! I discovered about a year ago just how relaxing coloring is and I really enjoy it. I can't believe now I can indulge my love of cozy mysteries and my love of coloring in this one series. Thank you for being the creative person you and and for sharing your talent with us. Happy New Year! Love the cover. Very nicely done. I love that the cover can be colored! 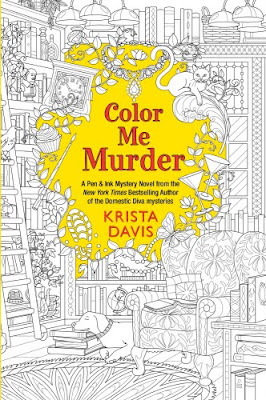 I love to color and reading mysteries. What a wonderful I idea to combine them. Can't wait to get them. I can't wait....I love to color!! What an absolutely cool idea, Krista! I can't wait. What a creative cover and yes, I do like to color. Looking forward to reading your book. This sounds like so much fun!!! I can't wait!!! I love to color!! I can't wait for this book. I haven't started coloring although I bought artist grade colored pencils and a coloring book for my husband last Christmas. He has really taken to it and we've upgraded his pencils to professional colored pencils made in Europe! This book sounds like a blast. Coloring is meditative and relaxing. I am looking forward to this book!